This resource section is sponsored by an educational grant from MSD. 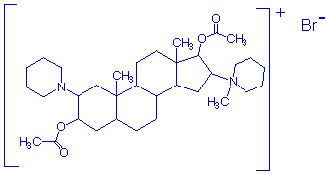 A bis-quaternary aminosteroid, which is the mono-quaternary analogue of pancuronium. It is a short-acting relaxant, prepared as a powder, which is dissolved in sterile water immediately prior to use, to yield a clear solution 2 mg/ml. These are minimal, although the potential problems listed under atracurium apply. Histamine release is not a feature, and placental transfer is minimal. Vecuronium is excreted both in the bile and urine. Its action is slightly prolonged in renal impairment. In the liver, vecuronium undergoes deacetylation to the active metabolites 3- and 17-hydroxy- and 3,17-dihydroxyvecuronium. An IV dose of 0.08-0.1 mg/kg will produce relaxation for 15-30 minutes and supplemental doses should be 1-2 mg.
Vecuronium powder does not need to be refrigerated.